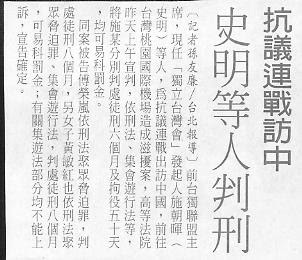 Today The Liberty Times reported on the charges levied against Su Beng and his assistant Bin Hong for their involvement in protesting Lien Chan's trip to meet with Chinese Commmunist leaders on April 26, 2005. On September 15, 2006 the Liberty Times newspaper reported that Su Beng had received a charge of serving 50 days in prison. It wasn’t clear just what the charge was for, but it was most likely related to Su Beng’s involvement in the events surrounding the April 26, 2005 protests of Lien Chan’s trip to China to meet with Communist China’s leaders. On that day, as Lien was departing from the Taiwan Taoyuan airport (then known as the Chiang Kai Shek airport) violence sparked between pan-blue and pan-green protestors at the airport. And earlier that day, as Lien Chan's motorcade made its way to the airport from his residence, several taxis (under Su Beng's instructions) followed behind in hot pursuit. While on the expressway, one of the taxis, in which Su Beng was riding, drove right up to Lien Chan’s car window and Su Beng held out a note for him to read, which read “Don’t sellout Taiwan.” The driver of this taxi was soon arrested and put in jail without bail. Su Beng and his people also went to the Taiwan Taoyuan airport that day to protest Lien Chan’s trip to China. They had fireworks in their possession, some of which were set off while they were there.